I remember when the slogan became popular. I was young but even then it made an impression of home and prompted thoughts of friendliness and being welcomed. Tom Bodett had no affiliation with the motel chain, but was a voice that helped launch the chain into the forefront of the market. But the ad-libbed slogan is what people remember (at least if you are my age or older). Anyone know what I’m talking about? A very simple statement that communicates a world of images and has stuck with the chain for over 20 years. I had not heard a radio ad for Motel 6 in years for some reason, but just this week I heard the familiar voice recite the familiar slogan on the radio. But the focus on my mind today is a little more personal – a little closer to home. How welcoming are you? We talk a lot about showing people God’s love and grace and many of us do that regularly – but on our terms and our time frame. What about the inconvenient drop-in to your office or to your home? When you are in the big middle of a huge project, how inviting are you to someone who needs to talk? God’s call on us as followers of the Way is to show love and grace as a way of lifestyle, not as a project we do on “Outreach Night” at the church. My prayer for each of us today is that we will be welcoming and inviting to those who need us. I have done this before, but I want to make the invitation to you again. If you need to talk or just simply want prayer for a need you may have, my email is to the right – please feel free to contact me. Easter is a time for remembering Jesus’ ultimate sacrifice but also a time for difficult self-examination. Are you ever guilty of shouting “Hosannah” on Sunday and “Crucify” during the week? Today is the day! And we have a winner! For those of you do not know what I am talking about, last week we had a little drawing. Last week I reviewed Francis Chan’s new book and study video, Forgotten God. To make it interesting I promised to give a copy of the book to one lucky winner. It was a lot of fun. And so today, congratulations are in order for Barbara Pinner. I will be emailing you today Barbara to make arrangements to get the book to you. For those of you who did not “win” this time, I encourage you to pick up a copy of the book the next time you are in a bookstore. All of us could stand to be reminded of the power of the Holy Spirit that is ours if we are followers of the Way. A word of warning about the book (you might want to check out my posts last week if you haven’t already), do not pick it up and read it if you are not willing to be challenged. I pray each of you have a truly blessed week this week. Today we are looking at the book and video, Forgotten God, as it pertains to the work of the Holy Spirit and the church. What we discussed yesterday regarding the work of the Spirit in the individual lives of believers is also true of the church. When individual followers of the Way are truly committed and submitted to following the leadership of the Spirit in their lives, the church will reflect this as well. As individuals, and corporately as the church, our purpose is to help others know Jesus and to come alive in him. Is your church doing that on a daily basis? Is your church doing supernatural things? Francis makes the statement in the book, “I don’t want my life to be explainable without the Holy Spirit.” Can you make that statement? Can you explain the importance of your church to your community apart from the work of the Holy Spirit? In the video (Session 3: Theology of the Holy Spirit 101) Francis uses a great illustration of a football team. He describes a team running onto the field at the beginning of a game – the crowd goes wild and the team responds accordingly with excitement. They huddle up on the field, call the play and then as they break, each player runs to the sideline and takes a seat on the bench. After 30 seconds or so, the team runs back onto the field, huddles up and repeats the previous scenario. After that happens a couple of times, the fans lose interest or worse, begin to see the game as pointless! The connection is that this is often how the church acts or at least looks to the community. We meet on Sunday and listen to an inspiring talk, and often we even leave with a challenge – a game plan for the week. But then when we walk through the doors of the church, we head for the sidelines. We have no intention of getting in the game and risk getting dirty or even hurt. The community looks at us and thinks, “Pointless.” Folks – that is sin! The church is to be about building up the body – helping people find a deeper relationship with Jesus and then encouraging those same followers to go out and make a difference. However, our churches have, in most cases, become a place of learning and institutionalization. In the process, the church has become a place that deadens passion instead of encouraging it. Does your church foster passion in you or does it seek conformity from you? How is your church a reflection of you? This study, Forgotten God, is not for the complacent and the satisfied. This study will challenge you and get in your business. So if you are not willing to be moved out of your comfort zone then I would recommend you stay away. But if you want more of God, this is a great place to start! What Do I Do About the Forgotten God? As promised yesterday, today and tomorrow the posts will be dedicated to the book and video by Francis Chan, entitled, Forgotten God. As I read through the book again, and watched the video one more time, some overarching ideas began to surface. Today I want to focus on the challenges Francis gives us as individual believers and then tomorrow we will take a look at what these challenges mean to the church. If you have ever listened to Francis or read Crazy Love (his first book), you know that his style is one of “telling it like it is,” and holding nothing back. Several places in the book and the video as well he asks the difficult question, “Do we really want to hear from God?” Do we really want more of God in our lives or do we just want God to bless what we are already doing so that we can feel good about ourselves? This is a question you need to ask yourself before picking up the book. The video is set up to follow the book and offer a small group discussion series around each chapter in the book. But ingrained in the approach is the idea that knowledge for the sake of knowing is worthless. In fact, it is possible to look at our own lives and see that added knowledge often does not lead to changed lifestyle or deeper commitment. It can even be seen that increased knowledge often leads to pride that actually stifles spiritual growth. So the challenge that Francis gives to us is that if we are studying this material with no intention of doing anything with it then we should put it down and walk away. The study is about the Holy Spirit – the “forgotten” person of the Trinity. God gives us the Spirit to empower us to be someone better – to do supernatural things. Do our lives reflect an empowerment by the Spirit? If someone can’t look at my life and say, “God is at work in his life,” then I am not living by the Holy Spirit. We don’t need the Spirit to live a good life and attend church on Sunday’s – we can do that all on our own. But loving as Jesus loved and ministering as he did to others, that will take the Spirit of God living and working in you. Do you have that? Do you do supernatural things daily? Do you really want to? It is God’s will for you to allow the Spirit to live in and through you. But we tend to get caught up in wanting to know “God’s will” without understanding what that really means. God is not concerned about a long term plan for your life as much as God wants you to be obedient in the moment. Francis reminds us that it is safer to commit to follow Jesus someday than it is this day. I have talked about this before (you can take a look at that post here). We are concerned about “knowing” God’s will when really we should be more concerned about being obedient in the moment. The book and video are filled with personal challenges that will “mess you up.” But that is Francis’ forte – the issue is, what will you do about it? If your plan is to read the book and watch the video and then move on to the next hot book on the market, then don’t even bother. But if your desire is to learn more about the Holy Spirit and submit to the Spirit in your daily life, then you need to work through this study for yourself. Tomorrow we will look at what the study says to the church. Don’t forget about the book give away (details here)! For those of you who read my ramblings regularly (which obviously would be you), you know that I do not make a habit of promoting particular items for you to go out and buy. My intention with this blog is never to turn it into an infomercial. 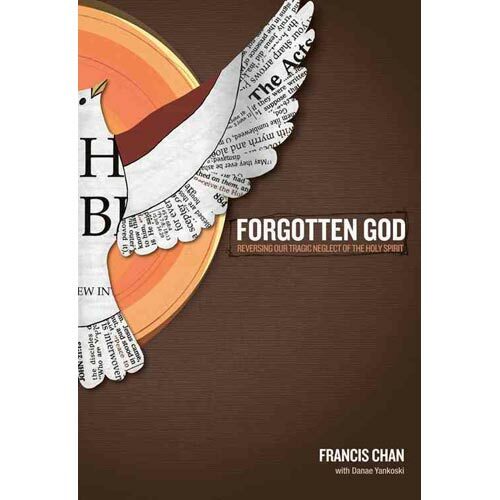 However, I was asked by David C. Cook Publishing, a couple of weeks ago to view the new Francis Chan video, Forgotten God, and then review it here at Clay In The Hands. You can hear what Francis says about the book here. I have read the book and watched the video, so over the next couple of days, I will be writing about it here. But wait, there’s more – I want to give the book away to one lucky person. OK, sorry, now it’s sounding like an infomercial. Seriously, I am excited about what Francis has to say and so I want to give a copy of the book away. Here is how we are going to do it. Each day this week, you can email me at the address to the right to enter (bhill33@me.com). Next Monday, March 29, I will randomly draw one name out of those who email. Check back tomorrow and Friday to get my thoughts on the book and video. I pray that God will use this to touch your life and open your eyes to the power that we so often neglect. One of the guys I follow in the church growth and missions realm is Ed Stetzer. I had a chance a couple of years ago to hear him in person at a conference I attended and since then I try and keep up with what he is doing. I was listening to him on a video this week (you can watch it here) and have been challenged. I have to say, I feel like there are times when I can answer yes to both these questions. But I also must say that my desire and calling is to combat this sin head on. When the church has become a place where we meet weekly because it is the “right” thing to do or it is the thing we do to hold our social position in the community, then the church is no longer the church, it is a country club. There is nothing wrong with a country club – but it should never replace the church. How do you see yourself in light of this sin?